Oct. 1st, 2012 - Apr, 19th, 2017 - Antoine Vignau and Olivier Zardini, founders of Brutal Deluxe Software, are proud to introduce their newest software to the Apple II community. 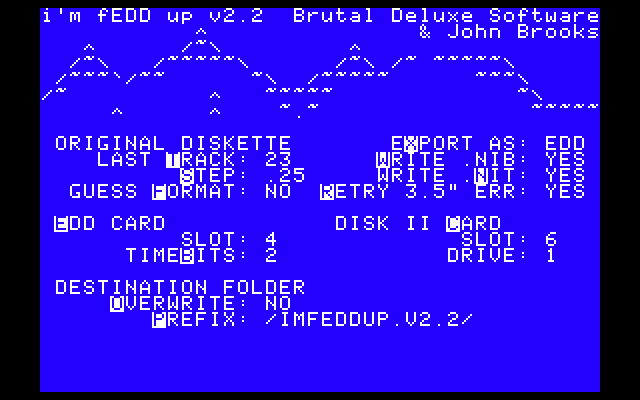 “i'm fEDD up” (now at version 2.3) is Brutal Deluxe's second answer to nowadays preservation of 3.5" and 5.25" diskettes on the Apple II. We would like to thank Daniel Kruszyna (krue.net) for his artwork. Thanks to John Brooks for the 3.5" NIB code. Thanks to Brian Wiser and 4am for their requests for improvements. Thanks to a2heaven.com for their RamWorks 8MB memory card. If Utilico Microware's EDD or compatible card is installed in your system, it will use the card's powerful features to read track data. It supports quarter, half and full tracks! It saves raw nibbles and their associated time cycles in separate files, for both 5.25" and 3.5" disks. The requirement of two drives is no longer needed. This option create a .DSK or .PO disk image from an unprotected 5.25" floppy disk. Enter an output filename of up to 11 characters. The application can guess the original file system. This option creates .NIB/.NIT from a protected or unprotected 3.5" disk. and a 3.5" disk in slot 5, drive 1. Shall I really tell what that does? Change timebits of nibbles (1 or 2). Default is 2. Select the slot & drive of your 5.25" disk controller card. Default is slot 6 and drive 1. The default interleaving is the DOS 3.3 one. By default, nibble files (.NIB) are written to disk. only the .EDD files are stored. By default, timing bits files (.NIT) are written to disk. If turned off, only the .EDD or .NIB files are stored. - CTRL-D to delete an unlocked binary file. Sometimes, a 3.5" disk is not read entirely in memory. To prevent creating bad files, the option loops until the disk is reliably read. You can interrupt by pressing the ESC key. Now, you can copy up to 40 tracks! file as a FDI one. The application saves different files on your disk drive. Please make sure you launch it from a 32MiB partition to save several disk images. If the program encounters an I/O error while saving, that will stop the copy process. before the Logic State Sequencer performs its magic. That means that data are read at a bit-level, it is a "simple" set of 1s and 0s. Each phase contains $4000 (16384) bytes. A standard $22 diskette (step 1 track) is 573,440 bytes long. The FDI format is similar to the EDD one in terms of bitstream. padded by $F8 zero bytes. Each phase contains $1A00 (6656) bytes. A standard $22 diskette (step 1 track) is 232,960 bytes long. For a 3.5" disk image, the length of the file is 1,376,256 bytes long. It saves nibbles time cycle in a dedicated file. The default value of the timebit is $2. - $02 for 40 cycles nibbles. It saves nibbles as they are read by the Integrated Woz Machine on an Apple //gs. Please refer to John Brooks' documentation for more information. For a 3.5" disk image, the length of the file is 1,376,256 bytes. It saves standard 16-sec disks of DOS 3.3, ProDOS, Pascal and CP/M disks. - .PO for ProDOS, Pascal and CP/M disks. The combination of the Track and Step factors generates files of different file sizes. It is a 6502 compatible application and it requires a 80-column card. It has been tested on Apple IIe Platinum, IIgs ROM 01 & ROM 3 versions. Parts of the source code (UP.EDD.S) are (c) 1986, Utilico Microware. 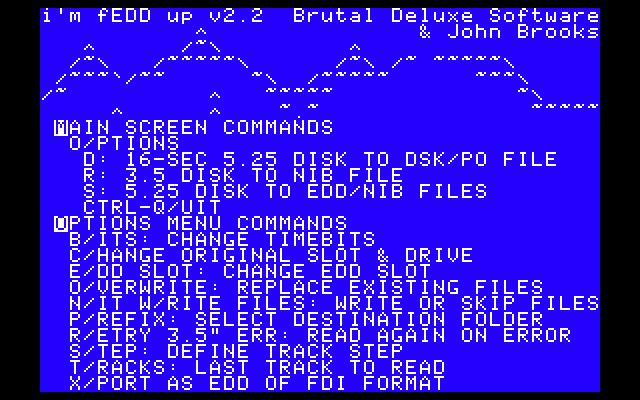 Parts of the source code (UP.DISK35.S) are (c) John Brooks.